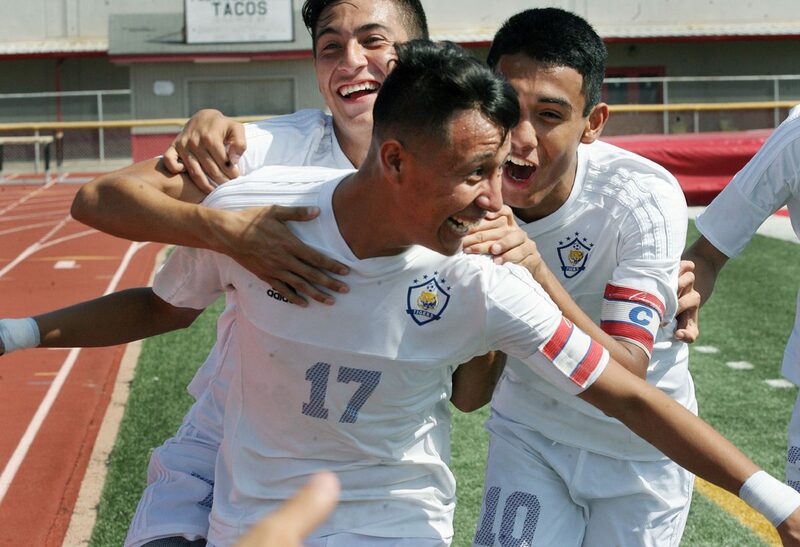 Valley View players Ricardo Mata, Mario De Los Santos and Jorge Amaya celebrate a goal by Mario De Los Santos during their game against Donna North at Richard Thompson Stadium Saturday March 31, 2018, in Sharyland. Valley View feats Donna North 5-3. The Valley’s top squads in football, basketball, baseball and soccer are in the mix for Class 6A Boys Team of the Year and Sub-6A Boys Team of the Year. 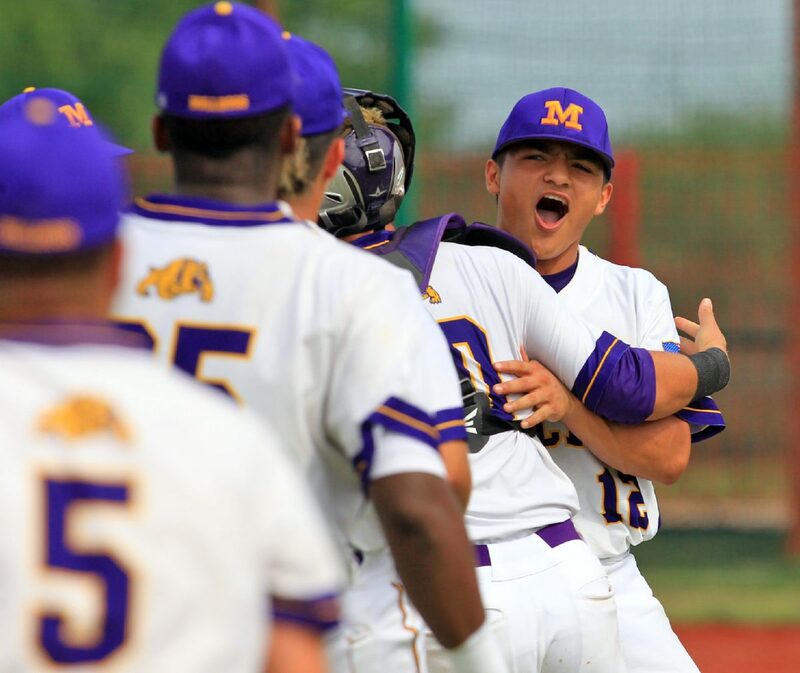 McAllen High's Robbie Maldonado (12) celebrates a team victory over Laredo United in a 6A Bi-District playoff game at Roma High School on Saturday, May 5, 2018 in Roma. 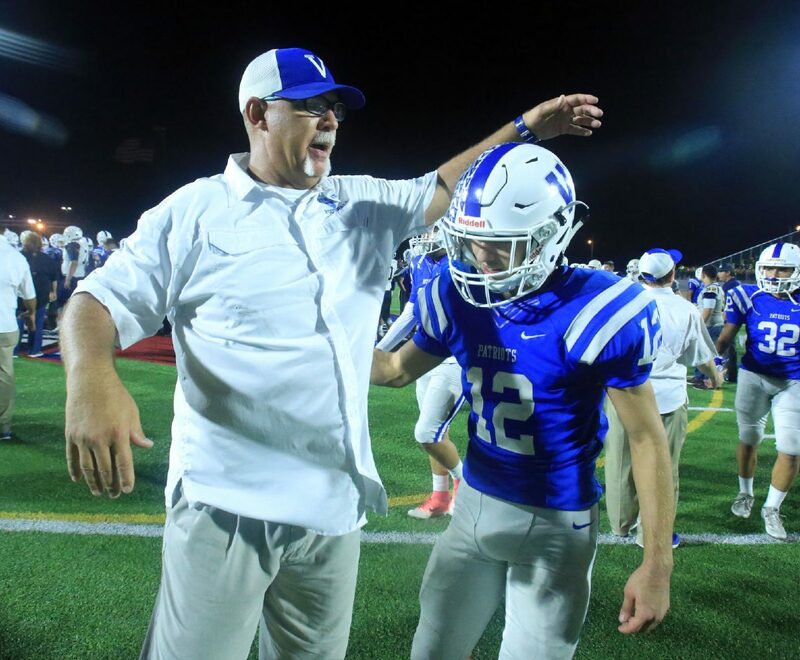 Mission Veterans head coach David Gilpin congratulates his son and quarterback Landry Gilpin (12) after their victory over Brownsville Lopez in a bi-district game at Tom Landry stadium on Fri., November 17, 2017, in Mission. 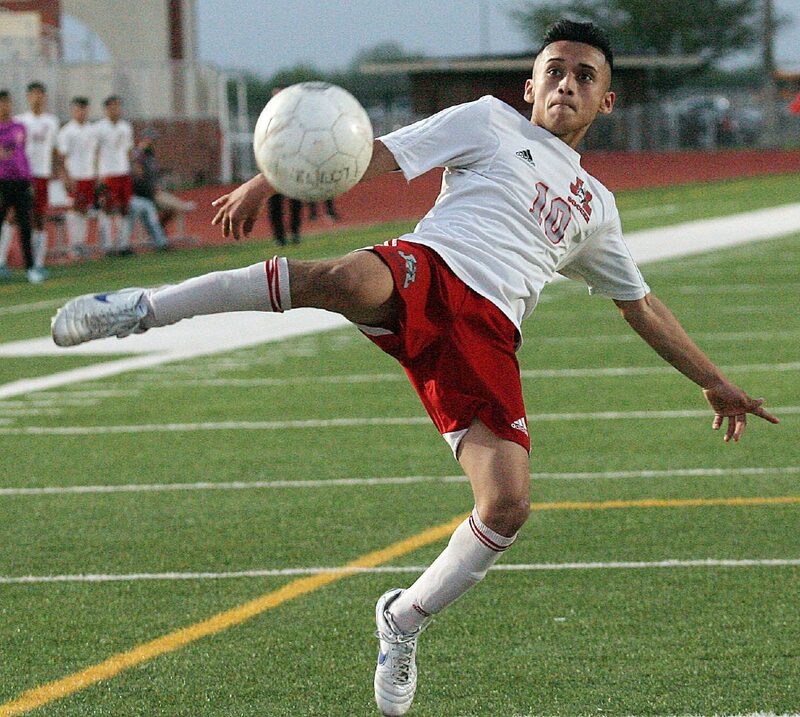 Juarez Lincoln Manuel Castrejon with a kick against Mission at La Joya stadium Friday March, 2, 2018 in La Joya. >> La Joya Juarez-Lincoln soccer: The 2017 regional champion Juarez-Lincoln Huskies were strong and dangerous for another season. Seniors Gerardo Reyes, Manuel Castrejon and Leo Pruneda led the group and got help from some newer additions, like freshman Edson Fonseca. In their playoff defeat — a regional semifinal loss to eventual state runners-up San Antonio Reagan — the Huskies heavily outshot and outplayed the Rattlers but weren’t able to beat the keeper or the crossbar. >> San Benito football: The Hounds steamrolled through a tough District 32-6A with a perfect 7-0 record and were 10-0 on the season. They beat Edinburg North 50-7 in the bi-district round of the playoffs, then beat McAllen Memorial 44-35 in the area round before falling to San Antonio O’Connor 52-43 in the third round. >> Mission Veterans football: Thanks to The Monitor’s All-Area Player of the Year (quarterback Landry Gilpin) and The Monitor’s All-Area Newcomer of the Year (wide receiver Mikey Garcia), the Patriots owned the most prolific offense in the Valley. After racing out to an 8-0 start in 2017, Mission Veterans defeated Brownsville Lopez in the bi-district round of the playoffs and advanced to the area round. >> Santa Rosa basketball: The Warriors won their 14th straight league title and made their second straight UIL state tournament appearance. >> Valley View soccer: The Tigers were the class of the Valley for 31 perfect games this season. With striker Mario De Los Santos at the helm of the offense, Valley View only went to PKs twice all season. De Los Santos earned the RGV golden boot with 70 tallies on the year. At the state tournament, the Tigers outpassed and maybe even outplayed defending two-time reigning state championships Frisco Wakeland but couldn’t finish in the final third. The Tigers’ run came to an end with a 3-1 loss.